Off-the-track Thoroughbreds are fortunate to have rescues across the country fighting to help them transition to new careers as show and pleasure mounts. 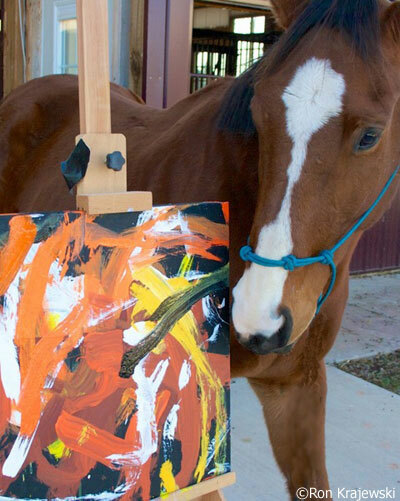 Ex-racehorses are competing in the English and western show arenas, enjoying the trails, and even … painting? Well, at least one increasingly famous ex-racer is. Meet Metro Meteor. Metro was a successful turf sprinter who won eight races and $300,000 in purse money during his four-year career. But chronic knee issues brought it to an end. He had already undergone two surgeries to remove bone chips, returning to racing after each, but eventually his knees forced him into retirement. Ron and Wendy Krajewski owned small percentages of a few racehorses, including Metro, through a partnership with Renpher Stables. When they heard that Metro needed a good home, they offered to adopt him. After nine months of vet care and rehabilitation for arthritis, carpitis, floating bone chips and ulcers, Ron was able to take Metro out on light trail rides. The gelding received injections and supplements to maintain lubrication and flexibility in his knees, and wore wedge shoes with pour-in pads. But after two years, Metro started growing bone in his knees. The vet said he had another couple of years or so before they would lock up completely and he’d have to be euthanized. His trail riding days were over. Although Metro couldn’t avoid the deterioration in his knees, one thing remained constant: his personality. Strong-willed, stubborn and cranky, he would pass the time spent in his stall by hanging his head out and bobbing it up and down. And although Ron says that Metro is obedient and will do whatever is asked of him, the gelding does it on his own terms: only after getting in a few head bobs first. A painter by trade, Ron wondered if he could put Metro’s quirk to good use by teaching him to hold a paintbrush. He started by training Metro to touch a canvas with his nose, rewarding him with a treat each time. Next, Ron would offer Metro the paintbrush, then take it from him and give him a treat whenever the gelding held the brush in his mouth. When Ron put the two skills together, Metro applied the paintbrush to the canvas on his own. Then it was just about adding some color. Ron was pleasantly surprised by the quality of Metro’s first painting, and that’s when the light bulb went off. He wondered if selling Metro’s works of art could help offset his increasing vet bills. When Metro’s first two paintings sold quickly and he made the front page of a local newspaper, Ron saw the bigger picture: Metro could also help other ex-racehorses. Since then, Ron and Wendy have been donating 50 percent of Metro’s profits to New Vocations Racehorse Adoption Program. Like any artist, Metro has his own studio, known as Studio 6 around the barn. The owner of the farm where Metro lives set aside stall 6 specifically for his gifted ward. “We covered it in canvas and he’s got an easel in there,” says Ron, who adds that Metro will also paint in the indoor arena or outside when TV crews visit. www.dreamgreenusa.com. Learn more about Metro at www.paintedbymetro.com. It really made me laugh, and now I want to teach my horse Storm to paint!